(Left to right) Former Johnston County DOT Maintenance Engineer Doug Williams of Four Oaks receives the Order of the Long Leaf Pine from NC Transportation Secretary Jim Trogdon on Jan. 31st at the NC DOT District Office on US70 near Selma. 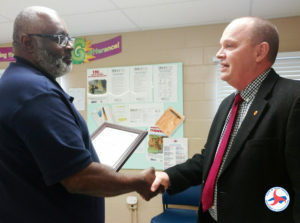 A long-time N.C. Department of Transportation employee who retired last year was recognized for his service to Johnston County. Joining the men at the department’s Johnston County maintenance yard outside Selma on Thursday were Durwood Stephenson, who leads the U.S. 70 Corridor Commission, Division 4 Engineer Ronnie Keeter and NCDOT’s chief engineer, Tim Little.